Some of the people she runs into, or meets up with in this book that contribute to a more complete picture of Faye are: an ex-boyfriend who is since married with a daughter, the men doing renovations on her apartment, a couple of writers she meets at a literary event, one of Faye’s writing students, her friend Amanda who works in fashion, a man she goes on a date with, and her cousin Lawrence and the guests at his house party. I liked Faye’s basement neighbours, who seemed totally unnecessarily nasty to Faye. But at least they were entertaining. I thought the best part of the book was the last chapter when Faye is visiting Lawrence’s house and the children are present; it adds some interest to the story to read about the adults and children interacting with each other. In the interview at 49th Shelf, Cusk says that she is surprised “that there hasn’t been more awareness of its central theme, which is children and the false morality that is displayed in so many of our dealings with them. I think I would point to the last chapter of the novel as the expression of my own views about the true nature of responsibility.” I wouldn’t have picked up on that myself. I said it seemed to me that most marriages worked in the same way that stories are said to do, through the suspension of disbelief. It wasn’t, in other words, perfection that sustained them so much as the avoidance of certain realities. In the end, for me, Faye’s character still isn’t quite enough to pull me into the book entirely. She still feels too remote, like she’s being held at arm’s length. Which is probably intentional and says something about Faye as a person, but for me it doesn’t work. I am now, however, curious about how I’ll feel about the third book in this series and will probably read it when it comes out. For a long time, I said, I believed that it was only through absolute passivity that you could learn to see what was really there. But my decision to create a disturbance by renovating my house had awoken a different reality, as though I had disturbed a beast sleeping in its lair. I had started to become, in effect, angry. I had started to desire power, because what I now realized is that other people had had it all along, that what I called fate was merely the reverberation of their will, a tale scripted not by some universal storyteller but by people who would elude justice for as long as their actions were met with resignation rather than outrage. How do you feel about Outline and Transit? Have you read any of her other books? Do you think it has a good chance of winning the Giller this year? Well, I’m glad you got a bit more out of this one than Outline. I do remember there being a good incisive passage or two about marriage in Outline. I will have copied them out in my book list file for the year. I remember noting quite a few passages I liked in Outline, but that just didn’t seem to be enough for me. I did find this one more enjoyable. Hooray! I enjoyed her earlier books more than this. Arlington Park, for instance…I’m reading Minds of Winter now, a powerful book. And thought Eden’s novel extraordinary. So that’s where my preferences sit…. I will have to check out one of her earlier books sometime, out of curiosity. It’s strange to me that people were hesitant about the first book, but the author is going forward with a trilogy. I do know the feeling of wanting to finish a series despite disappointments, though. I have this vampire romance series that I’ve roped myself into….Ugh. You’ll see a review next week. Many readers have loved Outline, and it has gotten very good reviews. I think part of my problem with it was that my expectations were so high from hearing about it from people who loved it. It *is* an interesting way to tell a story. Well, vampires that are more human than vampire and horribly idiotic leading ladies! Horribly idiotic leading ladies are worse than vampires! Given what you’ve said about these novels I think I shall wait until the third book is available and I have the opportunity to see the picture whole. I do worry though when you say that Cusk ‘is surprised “that there hasn’t been more awareness of its central theme, which is children and the false morality that is displayed in so many of our dealings with them. I think I would point to the last chapter of the novel as the expression of my own views about the true nature of responsibility.”’ If readers are not picking up on what the author considers to be the central theme you really have to ask how good a job she has done in communicating it. I’ve read Arlington Park and The Lucky Ones, which are rather different, more traditional in some ways, but some themes and preoccupations persist (marriage, identity, roles of wife/mother etc.). Novels about ideas have captured the Giller before (like Fifteen Dogs, by current jury member, Andre Alexis) but I’m not sure whether this is the book this year’s jury would agree to select as the winner. I’m curious to see what they’ve agreed upon. By then I’ll be finished the shortlisted books, but I’m still waiting on copies of two from the longlist. That’s an interesting quote about the author’s intentions. I can see where the theme of mothering is prominent in the book, and the theme of superficiality, but I haven’t sensed a direct connection there so far. Maybe because, in the book, we as readers can set aside her role of mothering easily, because the children are rarely present as characters but, of course, in Faye’s mind, she likely never completely forgets her identity as a mother, even when she’s focussed on other things temporarily? That’s a good point. And, yes, I can see the mothering theme – she does often have her children in her mind. Maybe the theme is strong in the author’s mind because she has all three books floating around in there all the time, whereas we have only read two of them so far. So my hypothesis is that I will like the third one even more than the second – I’m even lookinig forward to it! I really should try one of her older books sometime. I echo Cafe Society’s comment – it comes across as a little arrogant that she seems to be implying that the readers are at fault. If in general readers aren’t picking up on a theme, that suggest she hasn’t succeeded in getting it across. In fairness to Rachel Cusk, she was asked what surprised her most regarding questions/comments about her book. But yes, I would agree that if readers aren’t picking it up, then maybe it’s not coming across strongly enough. I have to admit that Outline and Transit have never really appealed to me. And I don’t think I will be picking them up anytime soon. Interesting review. I have found myself quite fascinated by the idea of Rachel Cusk as an author but haven’t got around to reading her yet. I like the sound of the premise of Outline, but have heard very mixed views about her work. I suspect I’ll pick her up soon, but perhaps not until next year. I think you’ve piqued my interest again! Outline does seem to be a love it or hate it kind of book. Although hate is probably too strong a word. If you wait another year or two, you’d be able to continue on to the third book without the wait! I didn’t really enjoy Outline that much, as you know, but since she apparently wrote the same kind of book again, I’m not sure what she’s up to. She’s obviously experimenting in some way, but I felt her tactic of having other people relate their stories while telling little about herself was too distancing. The problem with setting ourselves these challenges is that we end up sometimes having to read more than one book by someone who we didn’t enjoy the first time. I’m going through that now. Luckily, as with you, I’m liking my second Damon Galgut better than the first. However, the Booker and Walter Scott judges have a sad habit of picking multiple books by the same authors (you’d think there would be enough good books around not to have to do that) and there are several I am not looking forward to at all, based on my initial experience with them. Oh, that’s too bad. It’s disheartening when you didn’t enjoy the first one. Let’s hope their second books are better! I also felt too distanced in Outline. Transit was better for me. Actually, it turned out to be much better. Thank you, Naomi, for this post. I have read Cusk’s ‘Outline’ which worked for me. But my love for ‘Outline’ was heavily coloured by her memoir ‘Aftermath — On Marriage and Separation’. In her memoir ‘Aftermath’, Cusk is confused and depressed; her marriage has plummeted. Cusk does an autopsy of her marriage, of the roles that each partner played, the futility of the institutions called Marriage and Family, and in her own time explores the shadow that her failed relationship has cast on her children, her capacity in the society, and the modified aspects of her life. Her pain is sharp; it is not hard to empathise. However, I would have loved to understand the book viscerally rather than being lectured on Greek drama and Roman stories. I wanted Cusk to be more honest instead of being condescending and self-absorbed. The book worked for me in parts, especially the spots where she identified her contradictory views. She owned up to it. Otherwise, it felt like listening to a hotheaded acquaintance who loathes marriage just because it didn’t work for her. That bias is an anathema to memoir-writing right? I am not sure if I would read ‘Transit’, Naomi. But I am still adding it to my TBR. I haven’t read any of Rachel’s books, and to be honest, hearing her read from it a few weeks ago didn’t spark much interest either. Like you, the characters feel a bit distant, which I really struggle with as a reader, so i’ll probably pass this one by. I’ve read enough about Outline and Transit to pique my interest, but I do wonder if I’ll find the detachment of the character hard-going. Generally I need a character to root me in a story. The writing is very good and the style is interesting, if not my preferred way of telling a story. Some people absolutely love it, so it might be worth a try! I’ve read one of hers, and really didn’t like the very detached narrative and kind of clever-clever way of writing. I don’t mind a detached and cold author or narrator, but have to have something to hook onto. My husband disliked it, too, and we had taken it away on holiday to read together! 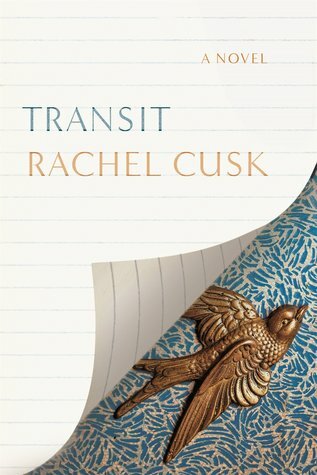 I have checked, and it was “The Bradshaw Variations” – review here: https://librofulltime.wordpress.com/2009/08/23/rachel-cusk-the-bradshaw-variations/ and it made my Worst Books of 2009 list! So I probably won’t be reading this trilogy! Oh dear, your criticisms of her other book sound very similar to mine of Outline, and also of Transit to a lesser extent. I even sometimes had a similar feeling of it being an “exercise in writing”. I guess her style must be a matter of taste. Yeah I felt the detachment & unhappiness of Faye in Outline a bit difficult to plow through — though I liked some of the writing in the book & just the thoughts on the relationship between men & women. It almost felt like nonfiction in a way. I also have some trepidation about picking up Transit — but will likely get to it in 2018. Will they give Cusk the Giller? Yes! It felt a bit like nonfiction to me, too. It *is* a lot of fun to read along with the jury and compare and make guesses! Ha! That’s funny! I remember that you loved Outline. Maybe we’ll agree on the third book! Will you read it?